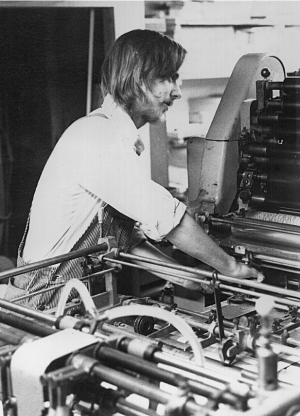 In honour of PQL’s upcoming fortieth anniversary, Tim is writing a memoir about his experiences at the press. This is the first chapter, and more will go up as he writes them. Click on the Still in Business category to read the chapters posted so far. I met Elke Koehler in September of 1967, in Professor Newman’s French tutorial that assembled three times a week in a room on the second floor of University College, at the University of Toronto. I was enrolled in Honours English. A challenging programme. Thirteen courses in the First Year … French, unfortunately, being three of them. There was Language Lab, which was odious, and there was a French Literature course that included Stendhal’s Le Rouge et le Noir and a brace of lengthy nineteenth-century novels that were equally incomprehensible, and there was a third compulsory course that might have been Grammar? I think it was Grammar. I was not good at French. In fact, I was utterly hopeless. Elke Koehler was German. Her hair was cut with accentuated sideboards. The other girls in French class didn’t do that. Elke wore business suits to class. I remember, in particular, the green one: the skirt, and especially the heels with the little oval buckles that she wore with it. Elke was enrolled in Modern Languages. She did well in German, not bad at all in Latin, she had a smattering of Greek, and she was considerably more advanced in French than I could ever hope to be. I was just a few short weeks removed from a summer working on the extragang for Canadian National Railways in northern Ontario. The near north. Capreol, Foleyet, Hornepayne. One day on the tracks in Burwash I swapped a package of cigarettes for the prison-issue shirt off the back of an inmate. It was blue. It had brass buttons. They were engraved. I wore it to French class, daily. With beige jeans, and exquisitely-tooled cowboy boots I had purchased at Thriftys on Church Street, at Queen. '... flowers in her hair.' Elke Koehler. 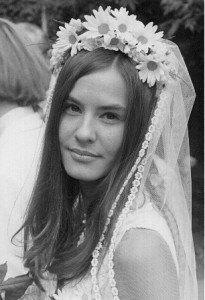 August, 1970. Professor Newman, as I recall, once took it upon himself to make some sort of commentary about my wardrobe. I suspect he was likely trying to be witty, but he probably said what he had to say in French, and I probably did not understand what he had said. I think Elke must have realized, very early on, that I needed help, in the most desperate of possible ways. Elke and I were married in August, 1970 in the Thomas Aquinas chapel at the Newman Centre on the north side of Harbord Street, just across the playing field from University College. The next spring I started working for the legendary Dave Godfrey’s Press Porcépic, which set up shop in the basement of the house at 671 Spadina that had once nurtured the House of Anansi, and then somewhat later, newpress. In the fall of 1971 Porcépic relocated to a nineteenth-century storefront on the Main Street of Erin Village, Wellington County, about an hour north-west of civilization as we had once remembered it. We had an outhouse. Two holes. Behind the horse shed out back, overlooking the millpond. And we had an oil stove, for heat, on the ground floor. Our flat was on the second floor. There was no heat, but the exhaust pipe from the oil stove on the ground floor did pass through the hall at one end of the upper floor. I had a trunk, a family heirloom, a remnant of an ill-advised ocean voyage back from a visit to the my mother’s family in Lancashire, in the late 1950s. We had an orange wool poncho we had purchased in Chihuahua, on our honeymoon. We positioned the poncho on the steamer trunk beside the oil stove and listened to CBC-Radio, most often Peter Gzowski’s `This Country in the Morning’, frequently while waiting for water in a large tub on the oil stove to warm so we could bathe, one body part at a time. We were fond of chocolate chip cookies from Holtom’s bakery, just three storefronts up the street. One day it was decided that we needed a break from the rigours of life in Erin Village, and that we should `go somewhere’. My suspicion, given that I had a university degree in English, was that I might be best advised to visit the office of the Erin Advocate and inquire as to the schedule of buses. Charlie Hull was the third-generation proprietor of the local paper, the morning I came calling. Mr Hull was also the editor, office manager, Intertype operator and pressman. He wore a green plastic visor, and gold tensor armsbands, to keep his shirt cuffs out of the ink. I was somewhat horrified to be apprised of this unexpected bit of intelligence. We did not own a car, and the thought that Erin Village might be inaccessible by public transportation of any kind had not occurred to me before we took up residence. Not too many months passed before I realized that I was more interested in the production side of publishing than Dave Godfrey would likely be inclined to invest in antiquated printing equipment. Godfrey’s interest in publishing was editorial, primarily, and political. Mine was more practical. I enjoyed making books. Elke & I bought a 1907 model Smyth National Book Sewing machine from a used equipment dealer in Windsor, for $700. The Porcupine’s Quill was incorporated in September of 1974, originally as the production arm of Dave Godfrey’s Press Porcépic. As early as 1975 I had already tired of printing books two pages at a time on a beat-up Multi 1250 on behalf of Porcépic. Taking courage in hand, I initialled a lease agreement with a printing equipment supply company that afforded me an ancient Baumfolder, a 24-inch single-colour ATF `Chief’, a Nu-Arc platemaker, a Pivano cutter with power on the blade, but just a manual clamp, and a schedule of onerous monthly payments calculated at an interest rate that bordered on usury. In 1975 a twenty-five percent deposit was enough to secure a lease on just about anything the printing equipment supply company was eager to sell and could just as easily repossess if timely payments were not forthcoming. Creditworthiness was not particularly an issue. The `power of the press’, however, does most certainly accrue to those who own one. And I, now, owned one. The first title Elke & I published under our own imprint was a first book of poems by Brian Johnson called Marzipan Lies (1975). Brian is currently the film critic for Maclean’s, and claims to have met Mick Jagger of the Rolling Stones, twice. Once in Toronto at a private school, rehearsing for a tour. Once in Cannes, at the film festival. The next year we ramped our publishing programme up to four titles, two of which were 32-page poetry collections, trimmed in a narrow format, one of which was Poems for American Daughters by C H (Marty) Gervais. I had met Marty at a League of Poets meeting a year earlier at the Empress Hotel in Victoria. Marty subsequently visited the shop in Erin Village, and Elke was more than a little surprised to recognize that my new poet friend had once pressed himself upon her on Philosophers’ Walk at the University of Toronto, some years earlier. We didn’t have many visitors to the shop on Main Street in Erin Village, in the early years … but there were a few. Marty Gervais subsequently distinguished himself in journalism at the Windsor Star and remains the publisher at Black Moss Press. John Flood taught at Le College Universitaire de Hearst, which once rated a mention in the Guiness Book of Records as the smallest university in the world. John Flood was the English Department, and occasionally booked a member of the League of Poets to do a reading in his class. John’s own first collection of poems, The Land They Occupied, concerns itself with Duncan Campbell Scott and the negotiation of James Bay Treaty (Number Nine) in the early 1900s. The Land They Occupied also appeared in 1976. John Flood continues to publish books under the Penumbra Press imprint from his office in Manotick, outside of Ottawa. Many of the early books we published were written by poets we had known at the University of Toronto. Ed Carson’s Scenes (1977), for example, and Brian Johnson’s Marzipan Lies. Others were related, in one way or another, to the idea of `north’ that came from poetry tours to high schools in the early seventies on behalf of the League of Poets. One tour, as the warm-up act for Joe Rosenblatt, took me to the Opera House in Gravenhurst, Parry Sound, the Miners’ Hotel in Cobalt and New Liskeard on a very cold morning in February, driving Faye Rosenblatt’s Fiat. Another tour, with Marty Gervais and John Flood, took us further north, to Elliot Lake, Chapleau, Kapuskasing, Hornepayne, Cochrane and thence to Moosonee on the Polar Bear Express. Both of those tours, as I recall, took place in February, but they wouldn’t have been in the same year. Early one spring, might have been March, we almost went through the ice on Lake Temagami in Doug Brown’s maroon pickup truck. Doug Brown had published some of my early poetry in a magazine called Copperfield, which we then printed for a few issues before it folded. The Porcupine’s Quill did a lot of contract book printing for a variety of small publishers in the 1970s and 80s. Copperfield magazine, Penumbra Press, Black Moss, Howard Aster’s Mosaic Press, Jack David’s Essays on Canadian Writing…. We needed the work. We owed a lot of money to the bank. But we also managed to produce a few nice books as well. Shadowed Leaves by Paul Smyth (Porcépic) garnered a citation from Design Canada / The Look of Books in 1974. In 1976 In Praise of Older Women by Marya Fiamengo (Mosaic) was similarly honoured. Ludwig Zeller’s When the Animal Rises from the Deep (Mosaic) won in 1977, as did my own miscellany called Letters (Black Moss) and Baldoon, (Porcupine’s Quill). In 1976 the thought occurred that the twenty-five percent equity deposit we had paid on the equipment lease, coupled with a bit of a track record of timely monthly payments just might be enough to persuade a chartered bank to refinance the equipment lease with a term loan at an interest rate a couple of percentage points under the legal definition of usury. I was correct in that assumption, though I was somewhat surprised when the bank – in addition to the chattel mortgage on the equipment – also required an assignment of receivables, an assignment of inventory, a position on my personal library, my wife’s jewellery, the family automobile and a significant position on the family home. Some months passed and the Porcupine’s Quill was awarded a lucrative contract to print and bind fifteen hundred copies of a quarterly published by the Canadian Council of Teachers of English. I approached the bank again, with a view to financing the purchase of a used Sulby AutoMinabinda to expedite production of the increased volume. The bank declined, on the grounds that I had no collateral beyond what they had already taken – which was everything. That would have been on a Friday. On the Sunday Elke and I attended a performance of James Reaney’s Donnelly trilogy staged at the Bathurst Street Theatre in Toronto by Keith Turnbull’s NDWT Company. At intermission I was interviewed in the lobby by CBC-Radio about the origin of some nineteenth-century wood type we had used in the design of the posters we had printed advertising the NDWT / Donnelly national tour. Monday morning the loans officer from the Royal Bank in Erin Village phoned up with the stunning news that he had heard me interviewed on CBC-Radio, that the very same credit application which had been declined on Friday afternoon had already been revisited, and approved, on the grounds that the bank had not hitherto realized that I was famous. This was news to me, as well. The moral of this anecdote as I currently understand it is: 1) do not part easily with excess collateral that may have an unanticipated future application; 2) do not assume that banking decisions are irreversible, or necessarily make sense; and, 3) do not, ever, pass up a media opportunity. 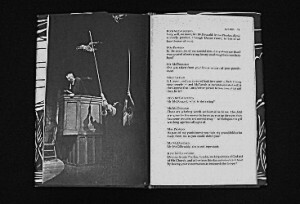 Baldoon (1976) was a play that Marty Gervais had co-written with James Reaney, around the time of the Donnelly national tour. The plot, as in Reaney’s trilogy about the Donnellys, is based on local history. In Baldoon settlement, near Wallaceburg, Ontario, a nineteenth-century farm family suffered a series of supernatural visitations, ranging from the usual poltergeist tricks – bullets and stones which passed through walls without leaving holes, pots and pans that flew about the kitchen – to fires and visions. Various efforts at exorcism failed. Finally, driven nearly to despair, John McTavish engaged the services of a certain Doctor Troyer and his psychic daughter from Long Point on Lake Erie and, following instructions, shot the wing of a stray goose in his flock with a silver bullet, thus causing the witch who was the source of the trouble to break her arm and be both identified and rendered harmless. 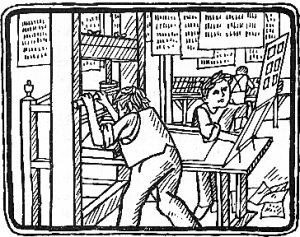 A woodcut by G. Brender à Brandis, commissioned for the cover of Baldoon. I was invited to spend a weekend at the schoolhouse Donna & Marty Gervais owned in Coatsworth, to help pick bullrushes with Keith Turnbull, Jerry Franken, David Ferry, and other members of the NDWT Company … to be used as props in a production of Baldoon. Driving back to Coatsworth from Wallaceburg late on the Saturday night, the cast was stopped by the Ontario Provincial Police. We were instructed to assemble into a file by the side of the road, and then to walk, as much as possible, in a straight line. Much to my surprise, I was singled out of the file as the straightest in the bunch, and instructed to take the wheel of the VW van. At issue, of course, was the inconvenient circumstance that I didn’t actually know how to manage the stick shift on the floor of a VW van, but Jerry Franken sat up front and talked me through the ordeal. The next morning, early, several of the cast members let it be known that they needed to be back in Toronto, soonish. It was decided that I was now the `driver’, based on my memorable success just a few short hours earlier. We set off, from the schoolhouse in Coatsworth, on an unfamiliar latticework of lines and concessions that led rather quickly to an unexpected ninety degree turn that I saw at the very latest possible moment, and nearly rolled the top-heavy VW van in an ungainly attempt to negotiate the unmarked curve. This was the morning that I almost, inadvertently, killed the NDWT Company. The little bit of a chance I had to hang out with the cast & company was surely a revelation to a printer from Erin Village who was accustomed to talking to troublesome Baumfolders, late into the night, always alone. The sexual appetite of the company was a revelation as well, though I seem to recall that James Reaney was taken to a strip joint in Wallaceburg that same weekend, and was horrified. In a strange way, a few of the actors I met at that time have remained friends, though very distant. Jerry Franken, years later, agreed to ride shotgun on the Erin Stage at a memorable reading given by James Reaney at an Eden Mills Writers’ Festival. David Ferry gave a memorable reading himself, at the Stratford Public Library the night we launched The Essential James Reaney (November 11, 2009). The production of the print edition of Baldoon was memorable because it marked the first time we had commissioned art for a jacket … in this case, a woodcut by Gerard Brender à Brandis … which was unusual, as well, because Ger was known for his wood engravings, rather than woodcuts, but we felt we needed a rougher, more simplistic, sort of treatment for Baldoon. The format was also a technical challenge. Baldoon was printed twelve pages up on the Chief and baumfolded to twenty-four page signatures, which is not easy, given that the first two folds are against the grain of the paper. This is a good example of the sort of thing I used to do, when I was young and mistakenly thought that I could do anything. Thirty years later, I know well enough that the Baumfolder we still run is not a sophisticated-enough machine to fold cross grain in the first section. In 1976, I didn’t know that. Naturally I was thrilled the next year when our `mass-market’ (sort-of) edition of Baldoon was favoured with a citation from Design Canada / the Look of Books in which the jury reported that the production `Succeeds admirably at presenting Canadian plays in an accessible paperback format … appropriate size … firm control of typographic elements throughout’. Robert Dickson. Credit: Mary Roche, the Canada Council. Robert Dickson was one of the more unique of the infrequent visitors to the shop on Main Street in the early 1970s. A poet, like the rest, but Mr Dickson was born and raised in Erin Village. He had graduated from Erin High, then attended university in Quebec, and eventually at the Sorbonne. He returned to Canada, where he taught at Laurentian University in Sudbury and pretty much single-handedly invented the notion of a franco-ontarienne literary culture. 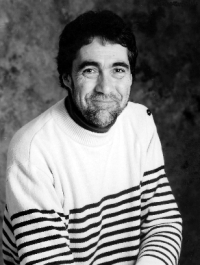 He was instrumental in the founding of Les Editions Prise de Parole, and he wrote lyrics with André Paiment for the influential folk/rock ensemble CANO. Robert’s parents still lived on the Main Street in Erin in the early 1970s. His mother, Rena, once attempted to teach me to square dance. Prise de Parole would later become one of our larger printing clients through to the end of the 1980s. Robert stopped in frequently, whenever he was in town to visit his parents. Often between Christmas and New Year’s. For some reason I thought it might be amusing to publish one of Erin’s more luminous expatriots in his language of preference, French. Une bonne trentaine appeared in 1978, and included the poem `Au nord de notre vie’ which was subsequently recorded by CANO on their second album (of the same name) and became recognized as the anthem of the franco-ontarienne cultural movement, partially because of the haunting quality of the vocal stylings contributed by Rachel Paiment. I stayed at Robert’s house in Sudbury one night on my way to a reading on Manitoulin Island. I remember there was a rather sizeable piece of the Laurentian Shield that protruded into the recreation room in the basement. in Times of Relative Peace) published by Prise de Parole. He was gracious in acknowledging that our publication of Une bonne trentaine had given him much-needed encouragement at an early stage in his career. Robert Dickson died in March of 2007 from brain cancer. Much to my surprise, the obits editor for The Globe & Mail telephoned to ask for advice. I argued, unfortunately not successfully, that the Globe should print the text of Robert’s most famous poem `Au nord de notre vie’, and print it in French. I lost the argument, but the realization that I had attained clout with the obituary department of the Globe was certainly a bit of unexpected news. In 1978 I dropped a small wrench onto the feed table of the ATF Chief while the press was running. Blank sheets of paper feeding into the impression gap carried the wrench between two cylinders under pressure before I had a chance to do much about it. I didn’t sleep well, that night. The vulcanized rubber blanket had absorbed much of the shock, but not all, and the press was immediately, and obviously, crippled by the distinct impression of a small wrench embedded into the circumference of the impression cylinder … which meant, basically, that the impression cylinder would have to be removed from the frame of the machine, resurfaced, and re-tooled on a lathe in a machine shop. This is not easy to do, on a Chief. The impression cylinder weighs maybe fifty or sixty pounds, by itself, and the cylinder is mounted at the bottom, directly underneath the blanket cylinder, which is itself set below the plate cylinder, each of which weighs another fifty or sixty pounds, which are both mounted under maybe a dozen ink rollers, some of which oscillate and involve intricate timing mechanisms on the operator side. There were, perhaps, four vertical feet of machine parts that would have to be removed from each side of the press to reach the impression cylinder. 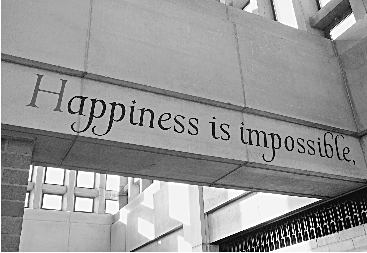 But neither am I a fool. I was completely aware that I was in a significant amount of trouble, with a machine that wasn’t anywhere close to being paid off. I knew a press mechanic, Jim Chandler from Cambridge, who wasn’t particularly knowledgeable on the Chief, but he was (relatively) local, and Jim had helped me out a couple of times with a smaller Multi 1250. Jim Chandler was confident, more so than I was. Jim and I commenced dis-assembling the Chief, one part at a time, and laid each very carefully on sheets of corrugated board on the floor of the pressroom. We had a roll of gummed labels, and we numbered each part consecutively as we dis-assembled with a view to expediting re-assembly in the reverse order in the minimum possible time. The dis-assembly took three, ten-hour, days. At this point I had pretty much stopped sleeping entirely, with worry. By the time we reached down to the impression cylinder we had over 1200 individual parts, labelled and numbered, placed strategically over the pressroom floor. The impression cylinder was removed, resurfaced, and retooled at a machine shop in Cambridge. By someone that Jim Chandler knew. Re-assembly was considerably more complex. We had all the parts, consecutively numbered. Reversing the order was not an issue. But the relation of some of the parts, one to the other, involved timing issues that would have been best documented with the stroke of a felt pen across one part to match the appropriate gear tooth on another part, preferably before said parts had been dis-assembled. Jim & I had not thought to do that thing, with the felt pen. Two weeks later the Chief was back in business, but tight registration on multi-colour work seemed to be less certain than it had been just two weeks earlier. We had the press inspected by a senior mechanic from the Sears Printing Equipment Supply company in Toronto. The diagnosis was that the `thrust’ bearings on the spindles either side of the impression cylinder were shot, and that the press would have to be dismantled, top down, a second time. Elke, in one of the more astonishing leaps of blind faith in our marriage, at a time when cash flow had been crippled by the prolonged demise of the Chief, nevertheless encouraged me to take heart in hand, and to borrow another $24,000 to buy a used Heidelberg KORD 64, Serial Number 39329, that was just eight years old, and in very decent shape. If I was nervous, I most certainly would not have wanted Elke, or the bank, to suspect anything of the sort. Scared shitless, might be a more accurate description of my frame of mind. At this point we owed easily a hundred thousand dollars, in real estate mortgages and capital equipment loans. Cash flow was an issue. Receivables, another issue. I was starting to realize, at this time, that I am not a salesman. I am reluctant to quote high, least I fail to meet expectations. And I am not much of a businessman, either, because I am reluctant to chase payment from people who owe for services rendered. And I wasn’t sleeping well. The Heidelberg KORD. Serial #339329. Credit: Sandra Traversy. The Chief had run quite happily for some years on the local variety of 220V 3 phase current supplied to us somewhat reluctantly by the Erin Hydro-Electric Commission. 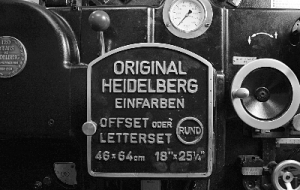 The night the Heidelberg was installed, it caught fire. A very expensive industrial electrician from Kitchener managed to convince me with the aid of a graph voltmeter, that the supposed 220v was actually +/-40, which is unacceptable as well as unhealthy to Heidelbergs. It was clear from the outset that the electrician in question was authoritative, because he smoked Cuban cigars. Big, fat, lengthy Cuban cigars. I presented the results of the analysis to the Erin Hydro-Electric Commission. Whereupon I was advised that the Erin Hydro-Electric Commission had no wish to do business with an unhappy customer. I was advised my options were to shut up, leave town or (alternatively) the Commission would be pleased to disconnect my service. I bought a Tracon KVA15 Transformer (serial #78-129C) for $613. I can’t remember where, or when, I met Paul Dutton. I was certainly aware of the considerable acclaim afforded bpnichol and the Four Horsemen, but I don’t recall that I saw the Horsemen in concert. And I don’t recall meeting bpnichol, either, though I certainly did know Paul Dutton and Steve McCaffery. This was just about the time that we were getting pretty accomplished at case-binding by hand, and also just about the time that I thought one way to wrest more profitability out of dismal poetry sales might be to go the deluxe (maybe the Folio Society) route. The Book of Numbers by Paul Dutton was published in 1979. An oblong format. Eight by eight inches square, that requires folding against the grain in the first section on the Baumfolder, which is not fun. Casebound by hand into Pakyo linen with garment-leather spine. Printed on Carlyle Japan in two colours throughout. Typeset in Helvetica by The Coach House Press. Paul Dutton first conceived this book working as an underemployed summer-student / bookkeeper, hence the printed grid lines on each page, and (since this book is laid out on a 31 line page) we provided (on page one) a vertical column of thirty-one `ones’ and totalled the sum – thirty-one. Page two features a vertical column of `twos’, and the total – sixty-two. By the time we reach page seven, the vertical columns have given way to a thirty-one line sampling of the zero to nine sequence, the sum of which is 136. The illustrations attempt to literally transcribe the text, as in chapter sixteen in which the second `one’ from the left is the same typeface, but smaller, than the first `one’ in the left-hand margin. The third `one’ is identical to the first, the fourth is completely different, in face and size, from each of the preceding three. The fifth is the same as the second, but the sixth and seventh are different, from each other and from any of the preceding five `ones’. A literal graphic presentation of the text: `one which is one is one which is not that which is not one but this which is one not that / one is any different or even the same which one is’. Page spread from The Book of Numbers (1979). I have been accused, by the poet Robin Skelton, of shoddy printing in the reproduction of my nineteenth-century wood numerals, but of course, I beg to differ. The numerals are old, and they are wood – it would have been easy (using offset technology) to repair their various cuts, nicks and scratches, but how much more challenging to hold open on the press the tiniest of pinhole flaws and reproduce the letters as they exist now in my type cabinet – the noble flaws of age included! 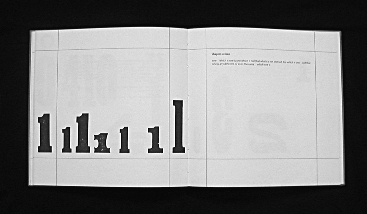 The Book of Numbers was awarded a Certificate of Merit by the Society of Graphic Designers of Canada (1981). Kurt Rathfelder worked, one summer, on Dave Godfrey’s investment farm at the north end of Erin Village, and then subsequently moved back to Toronto where he held a senior position at Judy Sarick’s Children’s Book Store on Markham Street in Mirvish Village. Kurt was aware there was residual demand for The Boy With an R in His Hand, a historical novel for children written by James Reaney and originally published by Macmillan in 1965. I was encouraged to contact Reaney’s agent, Sybil Hutchinson, with a view to acquiring rights to reprint. Sybil Hutchinson was a formidable figure of a certain age who had once been editor-in-chief at McClelland & Stewart where she had proposed a series called The Indian File … nine books of poetry, each by a different Canadian poet, published by McClelland & Stewart at a rate of one per year between 1948 and 1958. The books included The Strength of the Hills (1948) by Robert Finch; The Red Heart (1949) by James Reaney; and The Metal and the Flower (1956) by P. K. Page. 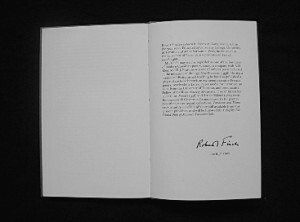 Three of the nine titles, including the Reaney and the Page, won the Governor General’s award for poetry. Lunch at Sybil Hutchinson’s apartment, on Hillsboro Avenue, just off Davenport, between Avenue Road and Yonge, was intimidating. Ms Hutchinson was forthright. It had been decided that the Porcupine’s Quill was to be permitted to publish a new edition of The Boy With an R in His Hand, at a price that I could afford, provided I also agreed to publish Variations & Theme, a new book of poems by Robert Finch that Ms Hutchison was having trouble placing elsewhere despite the fact that Mr Finch had won the Governor General’s award twice, in 1946, and again in 1961. 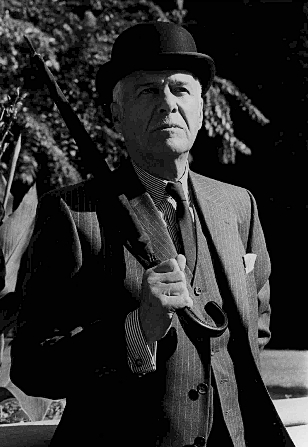 Robert Finch was born at Freeport, on Long Island in 1900. He was educated at University College, and at the Sorbonne. He joined the staff of the French Department at University College in 1928, and taught there until his retirement in 1968. He was elected to the Royal Society of Canada in 1963, and received the Lorne Pierce Gold Medal for literature in 1968. He co-edited The Sixth Sense: Individualism in French Poetry 1686-1760 with his colleague Eugène Joliat and he was blessed with a superior sort of fashion sense that manifest itself in the cut of his pin-striped suits, and the bowler hat that he often wore. The poetry of Robert Finch has been variously described as `intellectual’, and `elegant’ rather than sensuous. His is a poetry in which human emotion is `carefully husbanded and fastidiously winnowed’, a poetry that has been categorized as `dandyism’ because of its precedents in the work of the French Symbolistes and the English Aesthetes and Decadents. Fortunately for both of us, we never had occasion to meet when I was an undergraduate, though it is conceivable Mr Finch may have been aware of an article I had written for The Varsity in the spring of 1969, expressing my displeasure with the French Department at University College. Shortly thereafter I was summoned to the office of the Chairman of the Department. This summons was not totally unexpected. I had, in fact, been thrown out of Loyola High School in Montreal on three occasions in the 1960s, not for fighting, or swearing or cheating, but just for shooting my mouth off. The Jesuit fathers at Loyola did not take kindly to that. I had every expectation, approaching the office of Eugène Joliat, that my academic career at University College might be coming to an abrupt end. Much to my surprise, the expected expulsion did not happen. Instead I was presented with an ultimatum. In light of the article I had written for the Varsity, the Department was willing to adjust their evaluation of my term work over the previous year to give me a passing (50%) grade, provided I agreed not to enroll in another French course in my university career. The thought occurred (to me) that I might not be the most suitable of candidates to take on the publication of the later work of Robert Finch, but Sybil Hutchinson was not to be dissuaded. I was instructed to attend a lunch, to be hosted by Ms Hutchinson, at the University Women’s Club on St George Street, at which I was to be presented to Professor Finch. Sybil Hutchinson drove a hard bargain. In the end the Porcupine’s Quill published not only Variations & Theme (1980), but also Has and Is (1981), Twelve for Christmas (1982), The Grand Duke of Moscow’s Favourite Solo (1983), Double Tuning (1984), For the Back of a Likeness (1986), and finally Sail-boat and Lake (1988). Has & Is was favoured with a Malahat Award for book design in 1982. The Grand Duke of Moscow’s Favourite Solo was similarly honoured in 1984. Double Tuning won an Alcuin award for design in 1983. The relationship was never easy, the design awards notwithstanding, but one of the key advantages, for the press, was that Robert Finch maintained an apartment at Massey College and was always keen to organize book launching parties that were typically attended by the entire French Department of University College who generously pretended not to recognize me. Decorum, at all times, was of the uttermost importance. At one such launch event, Elke & I were instructed to construct the sales table in one specific corner (the north-east) of the senior Common Room overlooking the goldfish pond in the quadrangle at Massey College. There was a door, immediately behind us. Shortly before the launch was scheduled to begin, the door behind the sales table opened abruptly, and there stood the Master of the College, Robertson Davies. Seizing the opportunity, I thrust out my right hand and introduced myself. Davies peered, imperiously from beneath his eyebrows and announced `We have not been introduced,’ then swept by the two of us and into the more dignified throng in the Common Room. I was never introduced to Robertson Davies. At that launch, or any other. Another time I came upon Robert Finch quite by accident, dining alone at lunch in the Great Hall at Hart House. I approached my author to say hello, whereupon Finch expressed surprise that I had been allowed entry to the dining hall at Hart House. `But, I’m a graduate of University College,’ I offered, by way of explanation. In 1982 we published Twelve for Christmas, twelve rondeaux on poets, in a limited edition of 150 copies, casebound, by hand, by Elke. There were problems with the production, one of which was that Sybil Hutchinson felt that we should be decidedly more `generous’ in our distribution of complimentary author’s copies. It being the holiday season, and all. I explained that we were already offering the books for sale at somewhat less than half what they had cost us to produce. Sybil was not persuaded. Then I received a telephone call from a woman who had purchased a copy of Twelve for Christmas at the launching party, and insisted that the book was not signed by the author. I assured the caller that the book was, most definitely, signed by the author, and I knew that, because I had personally hand-numbered the edition, with a pen. 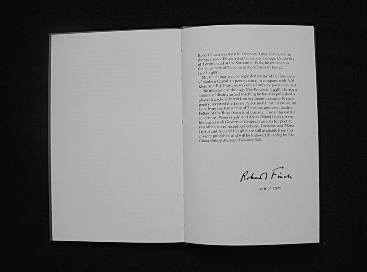 I directed the caller’s attention to the penultimate page, underneath the author biography, whereupon the caller informed me quite sharply that she had known Robert Finch personally for over fifty years, that Robert Finch was a person of great culture and learning who would never dream of signing a book anywhere other than on the title page, and, furthermore, she also had reason to know that Robert Finch favoured a particular colour of Waterman’s deep blue ink … which led her to suspect that the signature on the penultimate page of Twelve for Christmas had been forged, probably by an unscrupulous publisher. Exasperated, I offered the caller a full cash refund. This entry was posted in Still in Business, Tim’s blogs. Bookmark the permalink. Received your web blog via google the other day and absolutely find it irresistible. Continue the fantastic work.